What Paula Herbart lacks in physical stature, she makes up for in gusto. The 5-foot music teacher can command a stage, a classroom, and a union hall. Think Norma Rae with a touch of Mr. Holland’s Opus, sprinkled with Glee. Her personality formed early on all of those fronts. 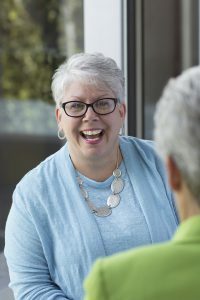 Paula Herbart served in numerous leadership roles in the Fraser Education Association before being elected president of Local 1, serving 16 districts in Macomb and Wayne counties, in 2012. She has served on the MEA and NEA Board of Directors and as chair of the 6-E Coordinating Council, in addition to a number of committees, coalitions, and task forces. Both of her parents were educators—her father in Fraser where Herbart would eventually start a teaching career and become president of the local union; and her mother in Fraser and Chippewa Valley, where Herbart attended school as a child. In elementary school, a “magical” music teacher first noticed Herbart’s flair for dramatic performance and encouraged her to keep at it—leading her down a path toward a semi-professional vocal career as an adult, in addition to teaching music. In fourth grade, the future MEA president staged her first protest outside of a classroom where a teacher failed to intervene in a bullying situation. A few years later, she watched her mother work as a strike captain during a 1979 teacher strike involving more than 30 districts statewide. “I grew up with the understanding that the institution of public education is sacred, and there’s no greater honor than to be involved in the fight for that,” she said. She was drafted into union activism in her very first year of teaching in 1992, serving as co-chair of her local’s Political Action Committee for three years and climbing her association’s leadership ladder rung by rung to become president of the Fraser Education Association in 2009. And leadership means being willing to answer tough questions and own difficult decisions. “The line of people who want to make decisions is a lot longer than the line of people who want to take responsibility for it,” she said. One of Herbart’s primary goals as the new MEA president will be to base decisions at the state level in the realities of locals, while simultaneously encouraging members and leaders at the local level to see a bigger role for themselves in union work. MEA is the last line of defense for full education funding and against privatization—to preserve community schools that serve the public good and not a corporation’s bottom line. Herbart believes in this fast-paced, information-overloaded society, individuals are longing to be heard. That’s when her instincts as singer, music teacher, and union advocate all kick in together. She wants to inspire others to lift their voices. She wants to sing the story of members in her big, dramatic way. And she wants to harness the collective power of school employees to keep public education strong.